* ... SAY WHAT? Men's Health, the magazine that loves to compile "best" and "worst" lists, is at it again. This time it rates the top 20 "Frown Towns" across the country, places where folks are just plain unhappy about everything from unemployment to foreclosures. 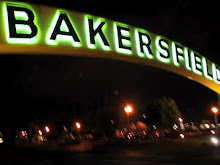 And sure enough, Bakersfield made the list along with Sacramento. Florida cities led the list (no doubt because of the housing crisis) with St. Petersburg, Tampa, Miami, Jacksonville and Orlando near the top. 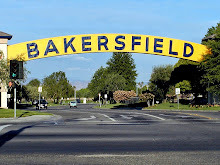 Pardon me, but my view is Bakersfield has shown real resilience in this long recession. Memo to Men's Health: personal happiness is not determined by one's Zip Code. * ... OUR TOWN: To that point, here's a valentine to our fair city. Twilla Klassen wrote that she was in a grocery store when she and another shopper allowed a man with one item to cut in line. 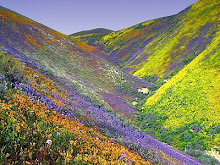 "He paid and left but when we checked out he had purchased a holly plant for each of us. What a great way to start the Christmas season. Blessings on him and his family." * ... TV ANTENNA: Bill Deaver wrote with this nugget about the old television antennas. "The item about the woman turning the TV antenna reminded me of a time back on the 1960s when my wife and I moved to a home on Mojave's west side. By the time we were moved in it was raining cats and coyotes (desert weather!). So I hooked the TV lead to a pair of metal pants-stretchers (remember them? ), and we got a great signal until I could get up on the roof and install an antenna. It helped that the LA TV antennas were on top of Mt. Wilson which was visible from Mojave!" * ... SPOTTED: Woman driving a black Mercedes SUV pulls through a Starbucks drive through lane with coffee in hand, but offers her dog the first sip before moving on. 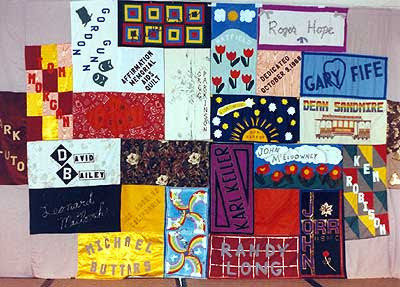 * ... AIDS QUILT: Eight panels of the national AIDS quilt will be on display Tuesday at The Metro Galleries on 19th Street. The public is invited to view the exhibit from 9 a.m. to 5 p.m. At 6 p.m. there will be a fund raising reception - hors d'oeuvres, no host bar and live music - to benefit Bakersfield's AIDS Project and Ricky's Retreat. The cost is $20 a person. * ... BOYS AND GIRLS: Another worthy fund raiser will be held Tuesday, December 5, at the Stockdale Boys and Girls Club behind Sam's Club on Gosford Road. It's the club's Bunco Night to benefit children living in homeless shelters. 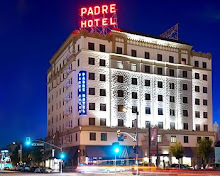 The cost is $35 per ticket and the fun gets under way at 6 p.m. For more information call Carole Cohen at (661) 496-4882. * ... WHO KNEW? : Did you know that the Fox Theater opened downtown on Christmas day in 1930, when movies were still called “talkies?” Other cities with Fox Theaters include Atlanta, Brooklyn and Detroit.